Aims: The primary aim of the RELAX-OAB study is to confirm the safety and efficacy of the Axonics r-SNM System, a miniaturized, rechargeable SNM system. Methods: A total of 51 OAB patients were implanted in a single-stage implant procedure. These results represent the 3-month outcomes. Subject outcomes were evaluated using 3-day bladder diaries and quality of life questionnaires. 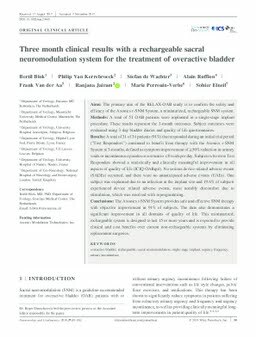 Results: A total of 31 of 34 patients (91%) that responded during an initial trial period (“Test Responders”) continued to benefit from therapy with the Axonics r-SNM System at 3-months, defined as symptom improvement of ≥50% reduction in urinary voids or incontinence episodes or a return to <8 voids per day. Subjects who were Test Responders showed a statistically and clinically meaningful improvement in all aspects of quality of life (ICIQ-OABqol). No serious device-related adverse events (SADEs) occurred, and there were no unanticipated adverse events (UAEs). One subject was explanted due to an infection at the implant site and 19.6% of subjects experienced device related adverse events, most notably discomfort due to stimulation, which was resolved with reprogramming. Conclusions: The Axonics r-SNM System provides safe and effective SNM therapy with objective improvement in 91% of subjects. The data also demonstrates a significant improvement in all domains of quality of life. This miniaturized, rechargeable system is designed to last 15 or more years and is expected to provide clinical and cost benefits over current non-rechargeable systems by eliminating replacement surgeries.